Inside Wildcat Stadium at the University of New Hampshire, the football team practices hard work, dedication and integrity. 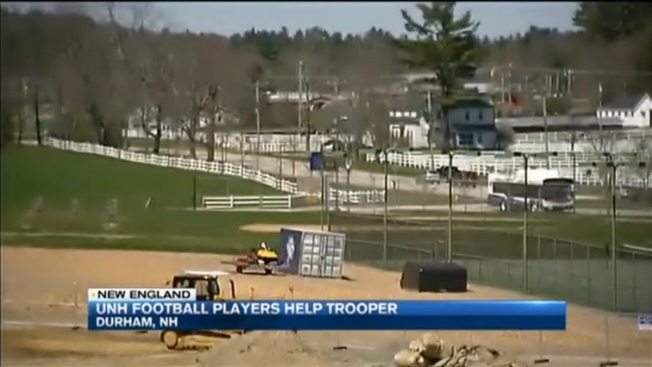 But it's the integrity shown off the field this month that has impressed not only their coach, but also the New Hampshire State Police. "I was pretty proud of them," coach Sean McDonnell said Wednesday. "I thought what they did was tremendous." He's talking about four of his players who jumped in to help when they saw a state trooper get punched in the face by an alleged drunk driver near campus. "He threw the first punch, but she fought back," said Lt. Christopher Vetter. "It got out of hand quickly this night." It was late on the Friday night of April 1 when Noah Robison, Ismail Asongwed, Quinlin Dean and Isiah Perkins witnessed the assault as they were driving by. They turned around immediately and went back to the scene. "I think our guys made a great choice, and that's what you want your student athletes to do - to make great choices to help people when they're in a tough situation," McDonnell said. The suspect, 22-year-old Christopher St. Onge, took off and was eventually arrested the next morning. The trooper wasn't seriously hurt, so the only thing they could do was write up a police report. "We are happy they're being recognized for this, because not everybody would have stopped," Lt. Vetter said. But that's hard to believe for these players, and it's why you're not hearing from them. The Wildcats refused to give themselves credit on camera. "I think they just know that's what people should do. I don't think they did anything extraordinary," McDonnell said. "I think they did what they wanted to do and I think more importantly, they did what they needed to do." The trooper who was involved in the incident is doing well. St. Onge is due back in court at a later date.